Saudi Arabia was home for 15 of the 19 9/11 hijackers. Saudis aren't banned from entering the US but war-weary Syrians are. Are the claims from this image accurate? Yes the facts are accurate, but the implication of causation is questionable. President Trump did sign an executive order banning the citizens of Iran, Syria, Libya, Iraq, Yemen, Sudan, Somalia from entering the US for 90 days. Here is a CNN article that gives the details. It's also true that Egypt, Saudi Arabia and Turkey are not on the list. The full text of the executive order can be seen here. Since Trump has not released his taxes, it's hard to know exactly what his financial dealings are, but it does appear he has some financial interests in those 3 countries. For more details read this article by the New York Daily News. Trump also currently licenses his name to two luxury towers in the Turkish metropolis of Istanbul. He received as much as $5 million from the deals last year, according to his latest financial disclosures. Furthermore, since the election, Trump’s development partner, Dogan Sirketler Grubu Holding, has seen its shares surge by nearly 11%. His [Trump's] latest Federal Election Commission filing lists two companies in the country, Trump Marks Egypt and Trump Marks Egypt LLC, both of which are most likely connected to a development venture. Their names followed a pattern set by Trump companies connected to hotel deals in foreign cities: in this case, Jiddah, the second-biggest city in Saudi Arabia. The statements in the meme are generally correct, but there is no evidence to support the implication that those countries were excluded because of Trump's business interests. The relevant section of the executive order signed by Trump (Section 3(c),) did not actually list any countries at all for the entry ban. Instead, it applied to a list of countries that has already existed under U.S. law for several years and was most recently updated a bit under a year ago by the Obama administration. 8 USC 1187(a)(12) defines countries whose nationals are explicitly excluded from the U.S. Visa Waiver Program due to terrorism-related concerns. Iraq and Syria are explicitly included in this list by law. The other countries on the list are designated by the Secretary of State or the Secretary of Homeland Security due to terrorism-related concerns in those countries. The most recent update to this list of countries prior to Trump's executive order was issued by President Obama's Secretary of Homeland Security on February 18, 2016, just under a year prior to Trump's executive order. 8 USC 1187(a)(12)(A) provides that the Secretary of State may designate to this list any country "the government of which has repeatedly provided support of acts of international terrorism." While the meme doesn't explicitly define what it considers to be a "Muslim country," if we define "Muslim countries" to mean "majority-Muslim countries," according to Wikipedia's list of Islam by Country, there are approximately 52 such countries or territories, 45 of which are absent from Department of Homeland Security's list. 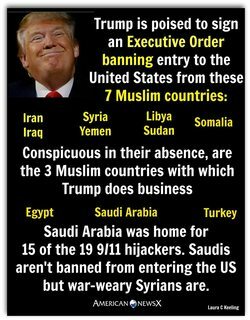 The three excluded countries listed in the meme are hardly alone among Muslim-majority in being absent from the list, nor is their absence particularly 'conspicuous.' There are a number of other Muslim-majority countries in which terrorism concerns are more widespread than in any of those three countries which are also absent from the list, such as Afghanistan and Pakistan, for example. Not the answer you're looking for? Browse other questions tagged united-states history donald-trump .